How to Staff the Team for Effective Content Marketing | Constellation Research Inc. Whether a business is B2B or B2C, content marketing is a dominant need as is the staff to carry it out. This report outlines the type of staff as well as the content marketing strategy needed to meet the demands of content marketing as a key differentiator in business today. 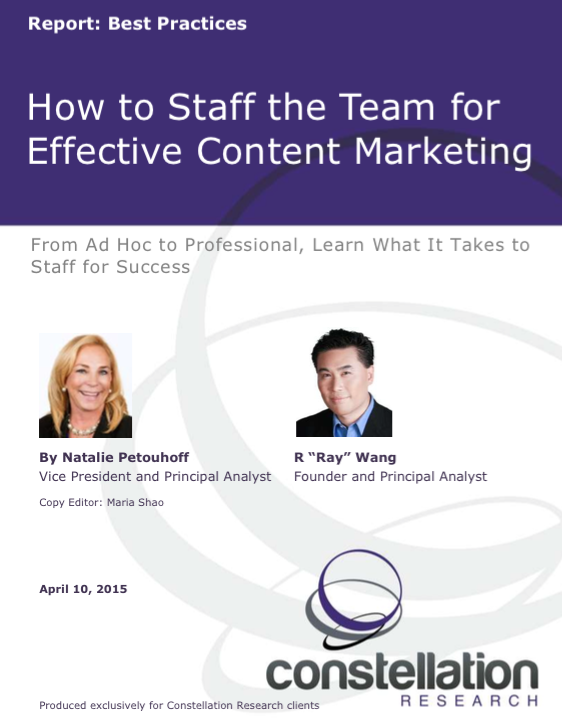 This report shares how leading organizations staff and tap resources for content marketing. Clients should use this document as a best practices guide in planning for the talent and business processes required for success. Building a content team does not mean just text, but includes many forms of media, from the written word to podcasts to videos to events to speaking engagements. The mix varies by company, but content is more than blog posts and white papers. Building a content marketing team and process is really about building a media company within your company.